Language Swap September (and August) schedule is up! This Fall will be a good one for our language learning community! Golingo is now offering two weekly language exchange events, covering five languages. 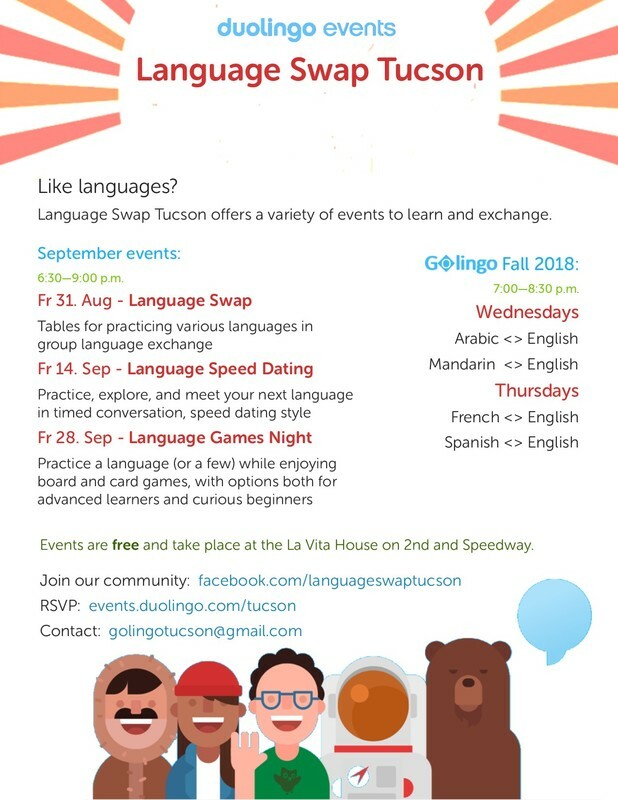 Additionally, Language Swap has scheduled three Friday events to take us through the end of September: our traditional Language Swap on August 31, Language Speed Dating on September 14, and a Games Night on the 28th. Hope to see you there! Friday, February 16, 6:00 - 9:00 p.m. If you are learning or speak another language, come practice with us on 2/16 at Language Swap! For full description, scroll down to earlier posts or check the event on Facebook or Meetup. 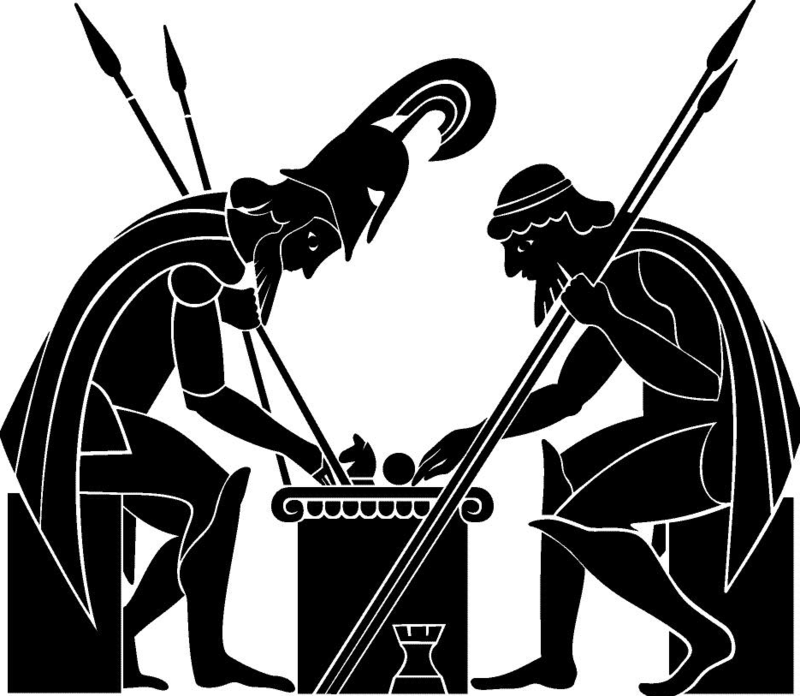 Saturday, February 9, 3:00 - 6:00 p.m.
​We'll be playing board and card games at the La Vita House this Saturday. To keep with the language theme, native speakers will be leading Basta! in Spanish and teaching us beginning Farsi with a fun board game. We'll also have Clue in German, and whatever game or language you choose to bring! La Vita House is walking distance from the U of A (with free street parking on weekends and evenings), and the event will be outside. See you there! Friday, January 12, 6:30 - 9:00 p.m.
Want to learn a new language but not sure what? Studying a language but have no one to talk to? Curious how to say _____ in a half dozen languages? Come meet your language match this Friday at Language Speed Dating! When the event starts, you will sit across from another attendee and have 4 minutes to talk in or about the languages you speak or learn. When the time is up, you'll switch to a new random partner. How you choose to divide your time is up to you, and the language possibilities are many. Perhaps one of you is learning Spanish and another is a Spanish speaker. Perhaps both of you are fanatics of Finnish. More likely, at least one will speak a language the other is mostly unfamiliar with, and you'll have a few minutes to learn the very basics, while sharing something you know in return. After the Language Speed Dating, we'll have some time to connect with the people we've just met, follow up with more language practice, or just socialize with friends new and old. Friday, December 1, 6:30 - 9:00 p.m. It's our last Language Swap of 2017! Come to practice one or many languages, or to share your own. Friday, October 20, 6:30 - 9:00 p.m. Whether you speak a foreign language, are learning a new language, or just want to make friends from the US and around the world, meet us at the La Vita House for a fun, international evening. So, what is the Language Swap? At its core, it is a place to practice languages in an informal and real way, talking with native speakers and other learners. More than that, it’s a place to make international connections, and we’d love to have you whether you are a fluent speaker or a day 0 beginner. There will be tables for various languages. Which ones changes every event, but I expect to see at least Spanish, French, English, and Arabic. Want to learn Italian? Farsi? Russian? Mandarin? Czech? This is also your place. Please let us know if you are interested in a specific language, so we can extend a special invite to native speakers. The event will be held at the La Vita House, just minutes from campus at Speedway and 2nd Ave.
It’s a short walk for students living on campus, and free parking is available for those who drive. Language Swap events with registration optional are posted first on Facebook, then copied here. For Golingo one-on-one language exchange, registration on our website is required.